It is very rare to find a place where you can go on a safari, meet a few reptiles, hang out with a monkey, a camel and a panther, get your face painted, and jam out to the number-one Journey tribute band in the country. Never say never! The Town of Bluffton is joining together with the Hilton Head Island and Okatie Rotary International divisions and Buckwalter Place to put on the 3rd Annual Bluffton Block Party, a Lowcountry Business Circle, LLC event. With kids getting back into the swing of school and the heat of summer simmering down, the block party is the perfect event for families to attend. As you may know, the Town of Bluffton is undergoing a “facelift.” New restaurants, stores and entertainment opportunities have created a metaphoric shift in the way residents feel about the community, the Lowcountry, and the Southern way of life. With these changes come an increase in visitors, a stimulated retail economy, and a certain je ne sais quoi that is infectious. 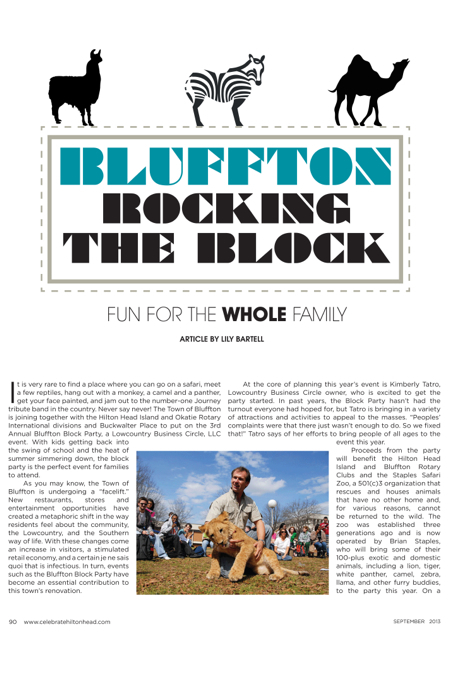 In turn, events such as the Bluffton Block Party have become an essential contribution to this town’s renovation. At the core of planning this year’s event is Kimberly Tatro, Lowcountry Business Circle owner, who is excited to get the party started. In past years, the Block Party hasn’t had the turnout everyone had hoped for, but Tatro is bringing in a variety of attractions and activities to appeal to the masses. “Peoples’ complaints were that there just wasn’t enough to do. So we fixed that!” Tatro says of her efforts to bring people of all ages to the event this year. Proceeds from the party will benefit the Hilton Head Island and Bluffton Rotary Clubs and the Staples Safari Zoo, a 501©3 organization that rescues and houses animals that have no other home and, for various reasons, cannot be returned to the wild. The zoo was established three generations ago and is now operated by Brian Staples, who will bring some of their 100-plus exotic and domestic animals, including a lion, tiger, white panther, camel, zebra, llama, and other furry buddies, to the party this year. On a more slithery, scaly, slimy note, Critter Management will be bringing out their reptile friends. Attendees will have the opportunity to meet the animals face-to-face, learn about their lives and what makes each creature unique. The event will have a carnival atmosphere with activities available such as face painting, inflatable bouncy houses, and plenty of space to run and play. Hilton Head Island Rotary Club members will be volunteering and the Okatie Rotary Club will be serving beverages, including beer and wine. All happenings will be broadcast by Adventure Radio 103.1 The Drive and The Island 93.5, who will serve as emcees for the day. Now, finally, the true reason why we are rocking the block: Listen up Journey fans! The number-one Journey tribute band, Departure, will be performing at the event. Based in Atlanta, this band travels all over the country to keep the Journey traditions alive. Don’t miss out on this great opportunity. The Bluffton Block Party takes place on Saturday, September 7 from 2-9 p.m. at Buckwalter Place. Tickets are $5 per person and are available at the door (cash only). Activities are free with admittance. Food and beverages sold separately. For more information, visit blufftonblockparty.com.